Have you ever wondered what the Hubble Deep Field – South (HDF-S) area would look like to an amateur astronomer? I did, and so I gave it a shot. This photograph shows the same field of view as included in the famous Hubble Deep Field South image, but instead taken by amateur astronomer Roger Groom. As my CCD imaging skills improved with regard to faint object photography this question of what the HDF-S looked like thorugh an amateur setup crossed my mind. I performed a lot of searching around the internet and to my amazement could not find any record of an amateur trying to image the area that HDF-S covered. In fact I could not find any record of any amateur taking an image of any of the 3 Hubble Deep Field regions (North, South, Ultra). I wondered why, as even if nothing is visible it would be interesting (I thought) to show that, and if nothing else to re-enforce the capabilities of The Hubble Space Telescope. I suspect there must be amateur astronomers who have attempted the HDF-S and do have their results on the internet but I simply can’t find them or their results. My camera and telescope combination does not lend its self well towards the usual bright large objects. The camera is NABG and has a small pixel size (9×9 microns) while the telescope has a long focal length. This instead positions it well for the photography of small faint objects with low overall image contrast. In 2006 I started to finally have a chance to use my SBIG ST7-ME camera in anger against dark, deep fields – areas where little but faint galaxies and stars were shown to exist. Fascinated by the prospect of imaging these faint (17th magnitude and fainter was my target) galaxies, and amazed with the capabilities available to an amateur astronomer such as myself I continued to improve my techniques. My images were turning out with (as best as I can estimate using plate matching & visual comparison) stars down to about magnitude 20 and galaxies down to about magnitude 19. These were quite pleasing results considering the relatively low specification equipment being used and relatively short exposures. With continuing success I continued to push the exposure times and search for the ever fainter objects. My exposure times were averaging around 10 – 20 minutes for each individual frame. The semi-automation of my setup allwoing the telescope to continue running un-attended during the night meant long exposures had become a small task – simply set the script to take 40 minute expsoures and leave it going. Then during the early hours of the morning have it set to take some dark frames, flat frames and park the telescope awaiting my return. It was about this time that the thought occurred to me “what about the HDF-S?”. With galaxies of magnitude 19 clearly visible in my images I thought that surely the HDF-S would be worth a crack, just to see what’s there with the full realization that I may in fact find nothing with my setup. Thus, I set about finding and photographing Hubble Deep Field (South). Thinking about this project there were many unknowns. Could my small setup detect enough light in the area to even have a reference point, let alone any non-stellar objects visible? Where was the Hubble Deep Field (South) and could I see it from my location (Perth, Western Australia), would there be a suitable guide star in the area allowing long exposures or would I be limited to unguided exposures? All these were unkown and could all put an end to my attempt at photographing the HDF-S. I set about solving these questions and commencing my project of imaging the Hubble Deep Field (South). While it now seems obvious where to find HDF-S information I was surprised to find it relatively hard using internet searching to locate the actual co-ordinates of HDF-S. It seems most press releases that are returned in searches are too “dumbed down” to contain this information. After some help from friendly Ice In Spaceforum members I was provided the information I needed, some RA and DEC co-ordinates. At first the information was confusing – I didn’t realise why some people were giving one RA and DEC set of co-ordinates while others were giving slightly different co-ordinates. I thought it was probably a case of mis-typing or simply bad sources of data that maybe had some level of inaccuracy or rounding. After some more reading and searching I then realised the full story. For HDF-S 3 of Hubble’s instruments were taking images at the same time (to my understanding), resulting in 3 sets of RA and DEC co-ordinates for “HDF-S”. These instruments were the STIS, NICMOS and WFPC2. It turns out that the commonly referred to “HDF-S” is the image taken by the WFPC2 camera, a wide field imaging camera. I now knew what RA and DEC co-ordinates I was after, the ones for the WFPC2 camera’s pointing position. Plugging the RA and DEC in to TheSky, slewing the scope around and snapping the first image was pretty easy from here. I ended up with this image that supposedly included the HDF-S, or did it? Was it more a case that the HDF-S included the FOV shown in my image? The fact is I didnt know the FOV of the HDF-S to be able to tell. That was to be the next question to solve. Having found the location of the Hubble Deep Field South I was able to determine what time of year would be best to image the object. I originally had this idea back in April of 2006, that is when I found out where this HDF-S was located. At that time the HDF-S was not well positioned for photography. I would only be able to start photographing it closer to June or July when it rose earlier, crossing the meridian at about 2am (local time). This meant a few months of waiting to learn more about how to photograph the HDF-S and preparing for the task. I also learned from this that I must complete my project before October of 2006. Once October hits a few factors start to work against this project: The ambient temperature rises such that I would only be able to cool the camera to 0 degrees C, perhaps -10 if I was lucky. Also the HDF-S would be rising earlier with it crossing the meridian before midnight resulting in it becoming consumed in the light pollution of Perth to the west of my location. So I now knew where the WFPC-2 image was taken. But how large is the image? What FOV does it cover and am I able to achieve anything close to that FOV? This question took quite a bit more hunting, becoming one of the most interesting parts of the project where I learned the most about the Hubble Space Telescope (HST). After several searches I couldn’t find a certain reference to exactly how large the HDF-S FOV was, like the RA and DEC it seemed to be commonly ignored in references to the HDF-S on the internet. This meant I needed to know a lot more about the HST and the WFPC-2’s characteristics to determine the FOV. From this I learned the aperture, focal length, f ratio and much more of the WFPC-2. There is an awful lot I still do not understand about what I was reading, but it was very interesting to find such detailed and technical information about the HST availble to the public. Using the knowledge of the HST’s focal length etc I calculated the FOV to 2.7 arc minutes square. I then stuck upon another search result clearly stating the FOV of the WFPC-2 camera is 2.7 arc minutes square. Wonderful! If only it was so easy the first time. At least my calculation was confirmed and I had learned a bundle in the mean time. Using the knowledge that the HDF is 2.7 arc minutes across, and my ST7 in the F/5.7 configuration is about 13.9 arc minutes across, it was easy to determine that in my 765 x 590 pixel image of the HDF-S the actual HDF-S is going to take up a square about 150 pixels wide. Excellent! I don’t think I could have hoped for much better. WHile it would have been nice if the HDF-S worked out to be about 500 pixels high in my camera that was simply unrealistic and would have been too lucky. As mentioned earlier, when starting this project I had a few main concerns and a major one was how big the HDF-S would actually be on my CCD chip. If it were tiny I would have no hope of seeing anything before I even started taking images, individual galaxies would simply be shown as single pixels at best. If it were huge the task would be too large for me to take on in a reasonable time frame. Having the FOV being about 150 pixels square is a nice size – not too big and not tiny. I could have increased my focal length by changing the focal ratio of my setup to F/7.5 resulting in a image of about 200 pixels square in size but this would have worsenned my already small pixel size of 1.04 arc seconds per pixel. With the information of the FOV size, and the positioning of the 3 cameras I could now put in to TheSky (astronomy software used for positioning the telescope and viewing the sky) field of view indicators for the 3 HST sensors. By doing this I knew exactly what any object would look like in the HST’s FOV – very interesting! This would help enormously with locating and acurately matching the HDF-S field of view to that of my photographs. I now knew where the image was taken and what size it should appear in my ST7. So what rotation is it? This would help me accurately match the FOV. The rotation of the WFPC-2 camera for the HDF-S can easily be found at the HFD-S web page where all the individual exposures are listed with actual RA, DEC, rotation and other notes. I’m simple minded and this doesn’t mean much to me “rotation compared to what?” I say. What did help is images found in abundance on the web showing the positioning of the 3 cameras used in the HDF-S experiment (WFPC-2 being one of them). From this I was able to visually match up the FOV with short exposures I took and hence determine an actual rotation of the WFPC-2 it’s self. I already had field of view indicators loaded in to TheSky for the 3 cameras at their actual separation, position relative to each other, and size. From this I could easily determine rotation by comparing to wide field images on the HDF-S site showing the 3 cameras overlaid on a wider field. This was real progress. I now had the positioning, size and rotation of the HDF-S. 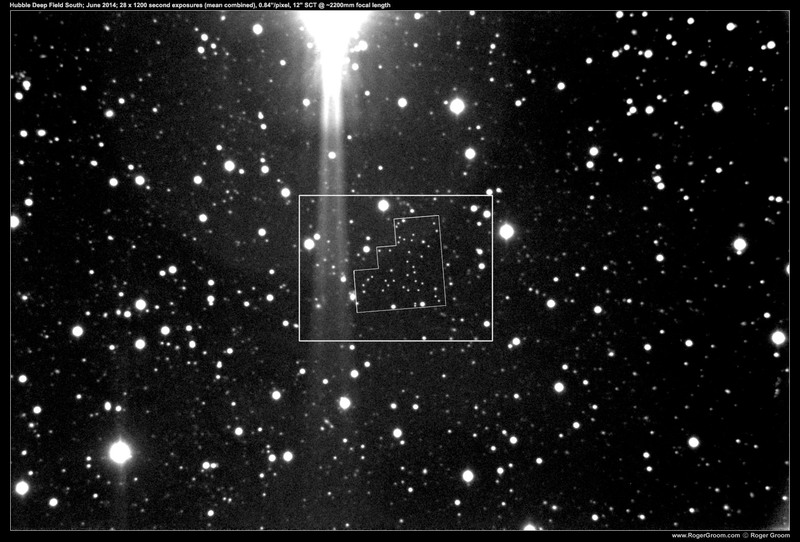 In fact I even had my first image plate solved to match the projected star field. This was coming together quite nicely. I mentioned earlier that a major concern was how large the HDF-S FOV was. Well another major concern was “is there a suitable guide star?” A suitable guide star would be one that is quite bright and easily positioned in my ST7’s guide chip while the HDF-S is in the primary CCD. The importance of a suitable guide star is clear to anyone familiar with astro phtogography: You need to autoguide long exposures in order to correct for telescope tracking imperfections and other tiny changes in movement. I was extremely lucky in this respect, a guide star enabling a guide exposure of 0.5 seconds with a brightness of about 1500 ADU was found in the guide CCD first off, amazing! While many astro photography experts and information resources recommend guide exposures of 2 seconds or longer I have always found that if I can achieve a guide exposure of 0.5 seconds I am able to dramatically increase the quality of resulting images. One can only assume the movements start to correct for some atmospherics however I find that hard to believe considering adaptive optics was invented for this purpose. Either way I am happy to simply accept that guide exposures of 0.5 seconds or shorter prodice nice shart star images. A limiting factor for me in my suburban location is the sky glow. Where I live is suburban Perth (Western Australia) light pollution is bad but not terrible. This light pollution would limit the exposure time that is practical, not day/night as a exposure that is too long will simply be washed out by the light pollution. After doing some test exposures of the area, and being confident of 10 minute exposures in the past, I settled on 20 minute and 40 minute exposures. I chose this as a time that was as long as I felt sensible for my equipment, and the light pollution of the area. I had not done any tests to accurately determine my sky fog limit (the point at which it is not worth extending the exposure time due to light pollution and other sky brightness factors). How many exposures would I need? the more the better. I knew from previous experience of the 10 minute exposures I would need at least 10 total to have any sort of smooth image. To make a good attempt, 30 would be a nice number. I only have so much patients and dedication, so a goal of 100 was unrealistic. 30 x 40 minutes is a long time: 20 hours. Assuming automated runs overnight this would take at least 4 nights. In addition dark frames are required, 5 is a good number to average, taking another two nights just for the dark frame exposures assuming that other conditions such as CCD temperature are consistent over the several viewing nights. While 20 hours is a long time, obvious after the first 40 minutes I’m going to have some data to work with. After one night I will have lots to play with. Having gone through the process of setting up for the HDF-S I was now ready to start the imaging runs. I would do this using CCDCommander to run the telescope overnight, so I didn’t have to sit waiting 40 minutes for every exposure to finish (I would have only recorded 2-3 exposures each night doing that, I need to work to pay for the hobby!). Taken during the winter months in Perth the nights of clear viewing were spread far and few between over the 3 months I spent photographing the field of view. Photography started with 20 minute exposures. After 3 successful nights of 20 minute exposures I progressed to 40 minute exposures. It was another 5 nights of 20 minute exposures before I had all the images I thought I would acquire for the project. Each night had a small number of dark frames taken, all of which would be averaged together and subtracted from the appropriate exposure frames. Not every night went according to plan, with some unexpected cloud, trakcing/guiding errors and strong winds interfearing with the images once I had left the setup to run automated. I ended up with a total of 22 good exposures, 32 total that were of reasonable quality (several more were taken but excluded due to major defects). The 10 of reasonable quality that were excluded had various defects: slightly elongated stars from guide errors, complete loss of guide star, light cloud interference, etc. At the point I reach 22 I decided to change my approach and hence bring to an end the first imaging run, and write this report. From here on if continuing with photographing the HDF-S FOV I plan to change to a F/7.5 focal ratio and use a wide band deep sky filter in an attempt to remove light pollution and increase contrast. I am reasonably happy with the result: 30 non-stellar objects that considering we are talking about the Hubble Deep Feild, I feel are relatively distinguishable. To locate the images I compared directly to an overlayed copy of the actual HDF-S image. Note that due to the nature of this relatively faint image what you see will depend very highly on your monitor settings, and that I identified the 30 points with the image enhanced (levels) more than shown here. I am not particularly happy with the overall image quality of this final image, more exposures would result in a smoother image with less noise, but there is a trade off of course, and I feel it more worth my time now switching equipment slightly as mentioned above. Also while flat fields were used it is obvious that more work could have been done in that area to reduce the gradient within the resulting image. 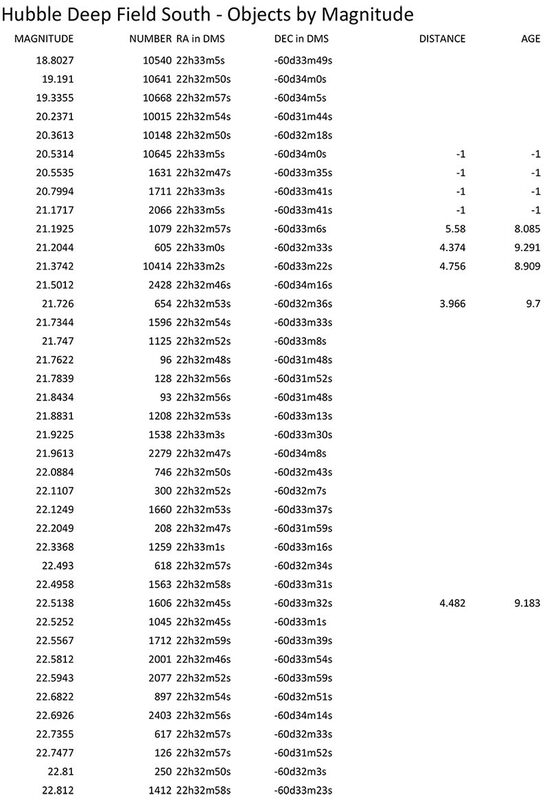 From my estimations using Astrometrica I believe the magnitude limit reached is around mag 22, +/- about 1 magnitude. This is a very rough estimation and I wish I could determine it with more accuracy by having knowledge of the objects within the FOV. For now this resulting image would do. I had spent 3 months working on the project in which time I hadn’t taken photographys of other astronomical objects, so I felt like a change and getting back to the “one night one FOV” type aproach to astro photography. It might be worth me noting the equipment being used for this project, to provide a comparison for readers. The telescope: 12″ Meade LX200 (classic) F/10 SCT. Reduced to F/5.75 using an F/3.3 reducer. The camera: SBIG ST7-ME, cooled to -20 degrees C (about 25 degrees below ambient). Software: TheSky 6, CCDSoft 5, CCD Commander, Focus Max, RegiStar, PhotoShop. All images were taken automated during overnight observing sessions in my backyard observatory. With 30 non-stellar objects distinguishable in my image I call this a huge success. Even if you can only see 10 of them with your computer settings that is still more than most people were thinking an amateur astronomy such as myself would be able to acquire in an image of HDF-S. It is very interesting to be able to taken an image and have available on the internet resources to then identify objects, magnitudes, distances and age. All this available and free to use. It would be interesting to dig in to this more and pin down exact figures for each object, compare and contrast those. Remember that the HDFS has a limit of 12 billion light years, and I can see objects to about 4 – 5 billion light years. As much as taking the images I found the exercise of this project in general quite enjoyable. I have learned much about the characteristics of the HST and attributes of the HDF-S, astronomy calculations in general, imaging techniques and so much more. What next I wonder? Perhaps to find my own “deep field” and face the challenge of identifying new objects in the field instead of simply matching to known objects. That’s no small challenge for an amateur, but then neither was photographing the HDFS. In June 2014 I set about reproducing my Hubble Deep Field (South) attempt but with my current equipment. A lot had changed since my first attempt above, in 2006! I have a new camera (ST8-XME), new mount (Paramount ME), new software (CCD Stack, PixInsight), and a whole 8 years worth of extra astrophotography experience. While many things have changed, conveniently enough the pixel scale (resolution) of my equipment has remained much the same, now being 0.84 arc seconds/pixel. Learning from the 2006 experience I started with 20 minute exposures and stuck with them. Now in 2014 with the Paramount ME doing 20 minute exposures is quite easy and so “why not”. I ended up with 28 of these 20 minute (1200 second) exposures I would use. 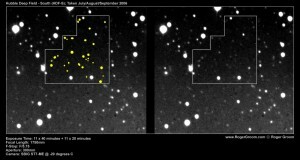 The new image shows approximately 35-40 non-stellar objects which are clearly distinct from background noise, which is a reasonable improvement on the 2006 effort. More importantly the image is clearer, with a flat background and generally higher quality. The new image shows many other non-stellar objects in the surrounding FOV. It often surprises me that people (amateurs) don’t do similar exposures elsewhere to “just see what’s out there”. Perhaps one problem would be idnetifying stellar vs non-stellar in a FOV which has not been previously well defined like that of the HDF-S.
Below are various images showing results from my 2014 Hubble Deep Field South run. Hubble Deep Field South – 28 x 1200s exposures (mean combined) 0.84″/pixel, ST8-XME, full FOV. Hubble Deep Field South – 28 x 1200s exposures (mean combined) 0.84″/pixel, ST8-XME, full FOV. Annotated to mark where the identified galaxies are. Hubble Deep Field South – 28 x 1200s exposures (mean combined) 0.84″/pixel, ST8-XME, full FOV. 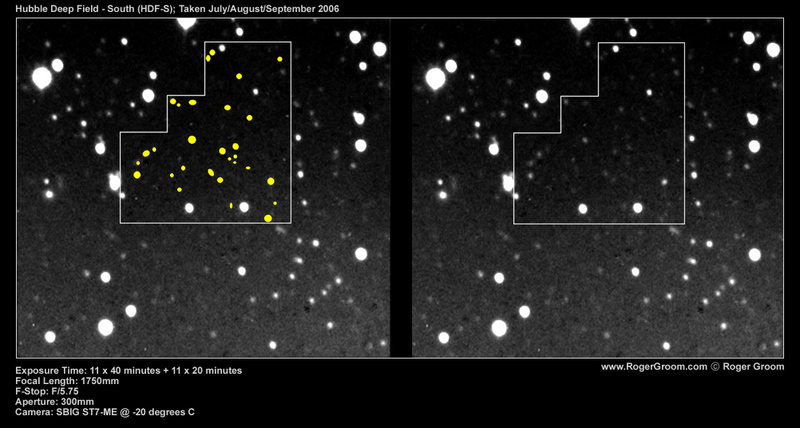 Comparison showing annotated and clear view. The following table shows the brightness of all the top 40 brightest objects that were catalogued in the Hubble Deep Field South. Presuming that the objects I have detected in my photograph are the brightest of the objects identified in the field, this table provides details of those objects. In some cases distance and age estimates are provided. The database of objects was kindly provided by the HDF-S team in 2006. Hubble Deep Field South – catalogue of brightest 40 objects in the image.